I was craving peanut butter cookies. I often use sunflower butter to substitute for peanut butter because I think the flavor profile is the closest I’ve tasted to peanut butter without actually being peanut butter. 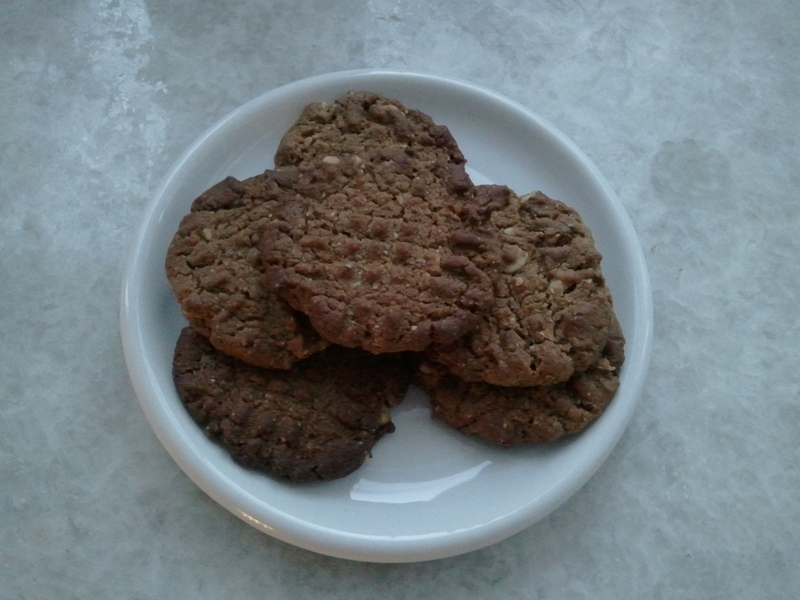 I use it to dip apple wedges in and celery sticks – so why not try subbing it in a cookie recipe? So that’s what I did. Preheat your oven to 350F. Line two baking sheets with parchment paper – this helps the cookies bake nice and evenly on the bottom without over browning, which is sometimes a problem with recipes that call for a lot of butter (or ghee in this case). Soften the ghee. I did this by putting the ghee in a small bowl and heating in the microwave for about 45 seconds. 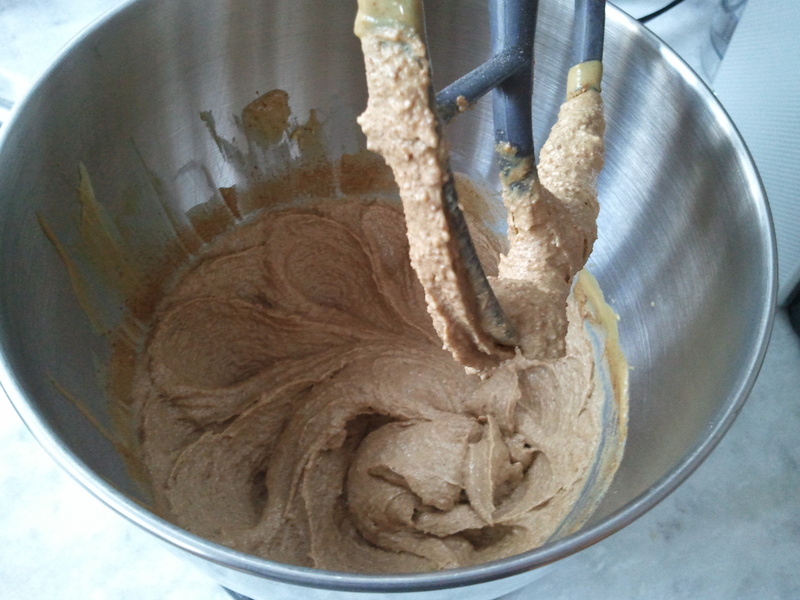 Cream the ghee and sunflower butter. 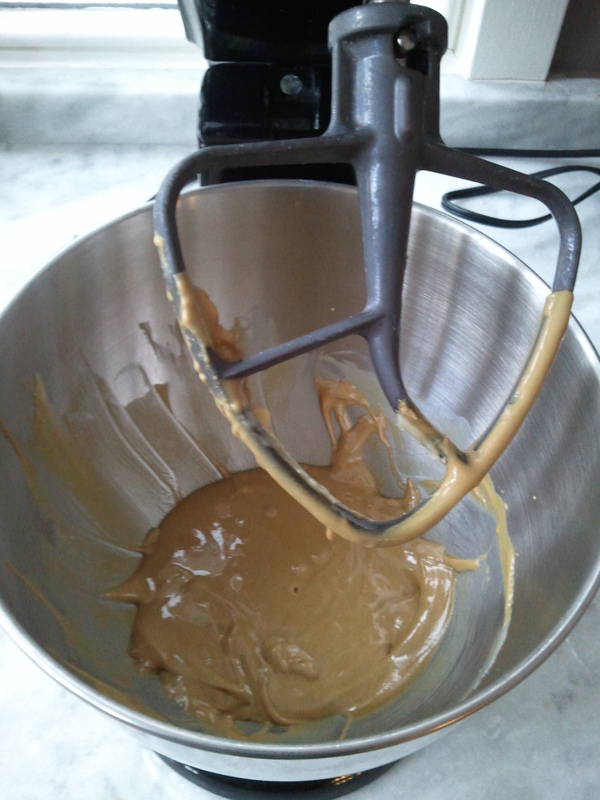 Next, add the palm sugar and mix well. Now add the egg and vanilla. Mix well. Mix the dry ingredients in a small bowl (baking soda, salt, almond flour and coconut flour). 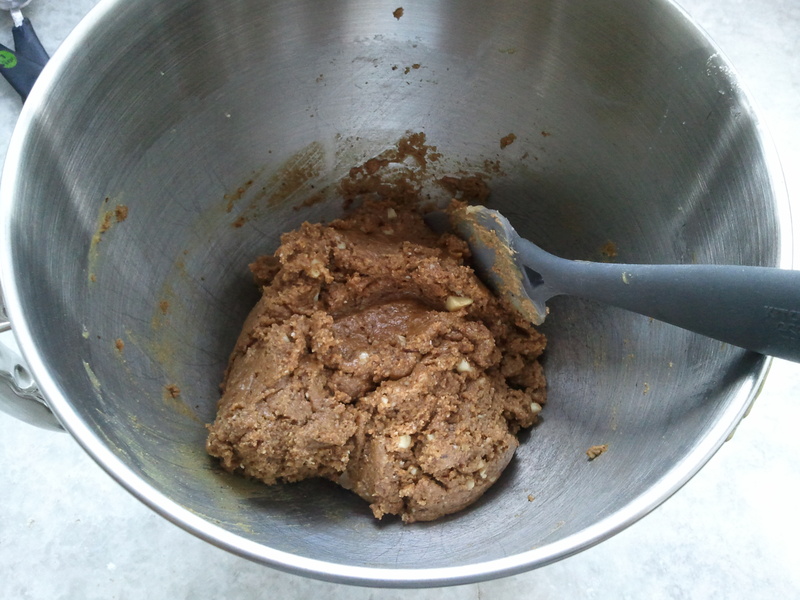 Add to the cookie batter progressively (add 1/2 c. and mix, then add last 1/2 c. and mix). Finally, add the chopped macadamia nuts. 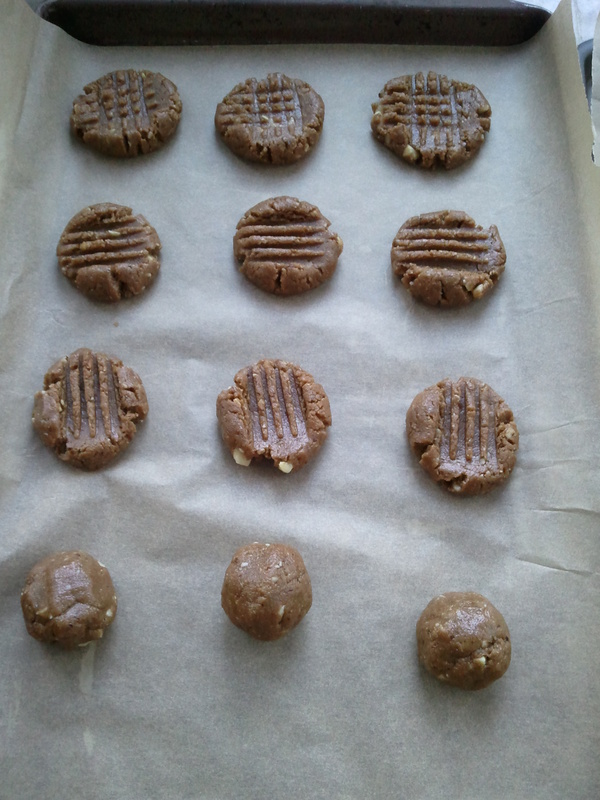 Take bits of the batter and roll it into small balls (~1.5 inch diameter) and lay them out onto your cookie sheet. This recipe makes about 24 cookies. As with traditional peanut butter cookies, use a fork to flatten the balls – this will make that crisscross pattern on the top of the cookie. Bake for 7 minutes at 350F, then lower the oven to 325F and bake for another 4 minutes (or until the cookie is firm to the touch). The edges should be golden brown. Allow the cookies to cool on cooling racks. Here’s the really super important part – let the cookies sit. Avoid the temptation to eat a warm cookie! They really need time to cool (and I mean totally cool) on the cooling racks. The cookies should be crispy and buttery 🙂 Note, if you want a chewier cookie, add an extra 1/4 c. of coconut flour and pull them out of the oven a minute or two earlier. 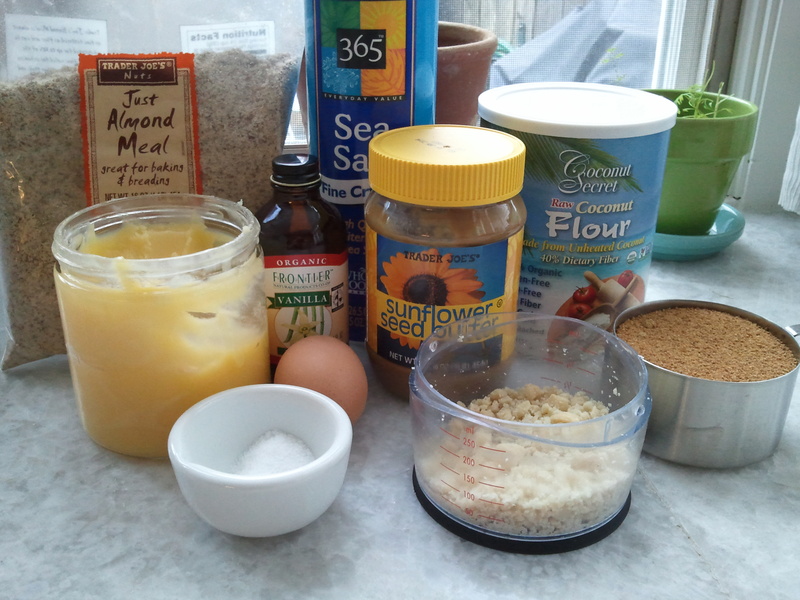 This entry was posted in cookie, dessert and tagged cookie, ghee, macadamia nuts, sunflower butter. Bookmark the permalink.